Do you have a tooth which is weak thanks to a crack or chip? Have you recently undergone root canal therapy? Or do you have teeth which have become decayed or damaged by an accident, or heavily filled? All of these problems can be addressed with the placement of a dental crown. A dental crown can be used on either front or back teeth, to seal and protect them from further damage. Dental crowns are a perfect option to restore a compromised tooth to its full potential, and can also be a useful option in cosmetic dentistry to instantly realign misshapen or crooked teeth. Your dental crowns are made from high grade, durable porcelain, either by our specialist dental technician or with CEREC technology. In both cases, they are fabricated using high grade, quality porcelains. Your dental crown will meet our requested shape and colour specifications and is a permanent solution to solve the many concerns and issues associated with a broken down, weak or misaligned tooth. A dental crown is cemented into place providing a long-term, natural aesthetic result. If you would like to know more about the options available for your situation, please contact us on (02) 9420 5050 for further information. 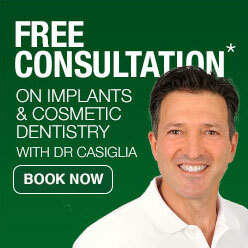 Apple Dental is located at 1 Finlayson St Lane Cove NSW 2066. To restore a tooth which is badly decayed, cracked, or damaged, a dental crown is custom-made from porcelain, metal, or a combination of both, to completely cover or cap your damaged tooth, restoring its natural appearance and function. A crown is a more complicated restoration than a filling, needing more laboratory time and more expensive materials than standard fillings. Usually, you will need to visit Apple Dental two or three times to reduce the size of your existing tooth, make a mould, fit a temporary crown and finally adhere your new permanent crown in place. What different types of dental crowns are there? Dental crowns can be made from stainless steel, gold or other metal alloy, all-porcelain ceramic, composite resin, zirconia, or from a metal or zirconia core, fused to porcelain on the outside for an attractive natural appearance. Depending on your personal situation, the Apple Dental team may be able to craft your ceramic crown using our CEREC CAD/CAM technology in our Lane Cove practice. In this case, the dental crown is milled out of a solid block of porcelain to your precise requirements, without the need for impressions or temporary restorations. No, your dental crown placement usually shouldn’t be painful, as we will numb the area with local anaesthetic before we begin. Once your procedure is complete and your crown is securely placed, the local anaesthetic will gradually wear off, and you may experience some sensitivity in the area. However, this pain will be very slight, and will soon wear off. Should I have a dental crown placed while I’m pregnant? As with all elective dental procedures, we recommend waiting until after pregnancy to have a dental crown placed, to minimise stress on both mother and baby. However, if you do need to have a crown placed immediately because of a sudden fracture or other trauma, be assured that the materials used for crowns are all safe for use during pregnancy, which means we will be able to provide you with a dental crown if necessary. Are there any potential side effects from having a dental crown? Having your tooth prepared for crown placement does place a lot of stress on your tooth. In some instances, this can cause your tooth nerve to become irretrievably inflamed, in which case you may require root canal therapy. How long should my new dental crown last? On average, your dental crown should provide good service for anywhere between ten and 20 years. But because crowns are still affected by tooth decay or fractures, it’s still very important to take good care when brushing and flossing around your crowned teeth, to avoid the potential need for replacing them in future. When playing contact sport, we strongly advise you to wear a custom-made mouthguard, to protect your porcelain crowns from damage and prolong their useful life.